The lovely newly built cottage fits beautifuly into its woodland setting. It provides luxury accommodation for a couple, and also has a sofa bed in the lounge. 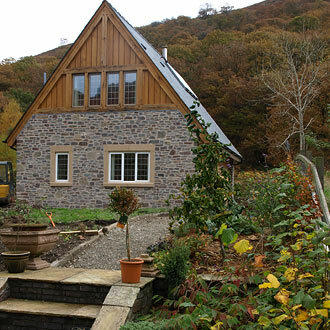 Pictures of the house inside and out, and the glorious surroundings of the Elan Valley Lakes. Peacefully situated in the heart of the country, next to the Elan Lakes, but convienient to the town of Rhayader and the main roads of central Wales. Peace and tranquillity accessible to town and activities. The self catering holiday accommodation is situated in the unique Grade II listed Elan Village. It has been built in the garden of Ty Olaf, the last house, in the village which was built in the Arts and Crafts style, over 100 years ago. 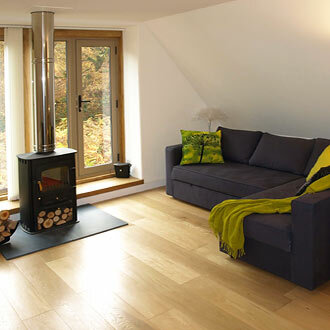 This luxury holiday cottage is newly built, faced with local stone and oak, and stylishly furnished. It looks straight out into ancient oak woodland that is part of the Carngafallt RSPB reserve. The area is one of outstanding natural beauty which can be enjoyed whatever the weather or season. Red Kites and buzzards sail overhead, while smaller birds are busy in the trees outside the window and sheep graze throughout the village. It is a haven of peace and tranquillity, fresh air and magnificent scenery. Here you can forget the rush of modern life, yet it is very accessible! The cottage is a great place to relax and unwind. There are a range of delightful walks from the door of the cottage, many paved and easy, or others better suited to those who enjoy a challenge. The Elan Valley Trail which follows the route of the railway which was used in the construction of the dams, is tarmacked for much of it’s length and is ideal for cycling. If walking or cycling are not your thing, short drives open up the whole of the area known as the ‘Lakeland of Wales’. Nature reserves, pony trekking, and fishing are available close by, there are many mountain bike trails and the area is a bird watchers’ paradise. There are seasonal guided walks from the Visitor Centre to discover the dawn chorus, bats, fungi, etc. 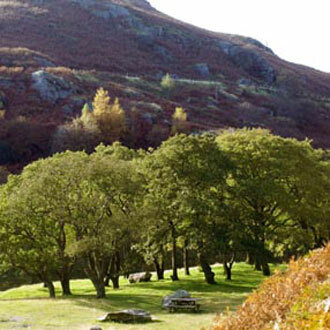 It is also a perfect base from which to explore central Wales. Hosts, Peter and Maggie, live next door, and provide local knowledge and a warm welcome including a pack of local produce and fresh flowers. The cottage is less than a mile from the nearest lake and the Elan Valley Visitor Centre. The Elan Valley Hotel, which has a bar and a restaurant is ½ mile via a pedestrian bridge. The town of Rhayader, with its shops, pubs and restaurants is three miles away, as is Gigrin Farm, famous as a Red Kite feeding centre. The Wye passes about 1½ miles from the cottage. Llanidloes, Llandrindod Wells, Builth Wells, Presteigne, Knighton (Offa’s Dyke) and Hay on Wye are all a short drive. The Heart of Wales railway links stations between Shrewsbury and Swansea and can be accessed in Llandrindod. On Saturdays throughout the summer there are carnivals, village shows, sheep dog trials and trotting races to experience. An hour’s drive will encompass Aberystwyth and the western coast, or Brecon and the Beacons, while the Snowdonia Mountains, the Gower or the Pembrokeshire coast are well within a day’s excursion.